PRODUCT DESCRIPTION: This guard is for use in the yard to protect either repellent granules or repellent liquids. It can also be used for baiting ants. The design is a strong plastic holding container that can be filled with liquid or dry material. The cap snaps on securely and will protect it's contents from rain and sun but the air vents located on the ground stake shaft will allow odor to release in the designated treatment area. These guards are discreet and small making them ideal for sensitive areas where children and pets might be active. More importantly, since the granules and liquid repellent will be protected, you're placements will last a lot longer. Essentially the guards will pay for themselves in less than a year. The holding tank is separated into two parts. Each side can hold up to 1.5 oz of liquid; 1-2 oz of granules. For Urine, it is best to use 1-2 ounces per guard which should be placed 8-10 feet apart. 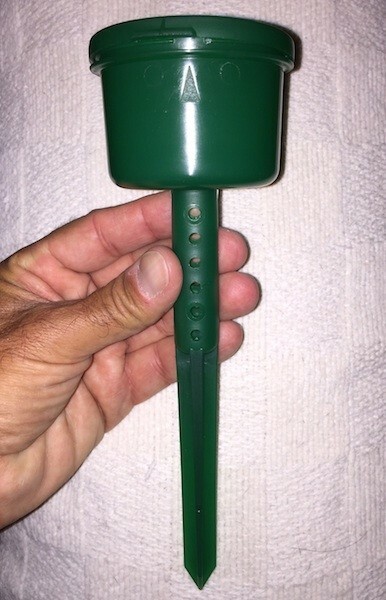 WHERE TO USE THEM: Around gardens, along flowerbeds, walk ways, around pools, along fence lines, under decks, around sheds or even along the perimeter of your home. In most cases, a combination of both this style and the small CAPSULE GUARD (for liquids only) will prove to be discreet and effective. RATE OF APPLICATION: For liquids like Urine, fill with 1-2 ounces and place every 8-10 feet. More can be used but 1-2 ounces should last 1-2 months. 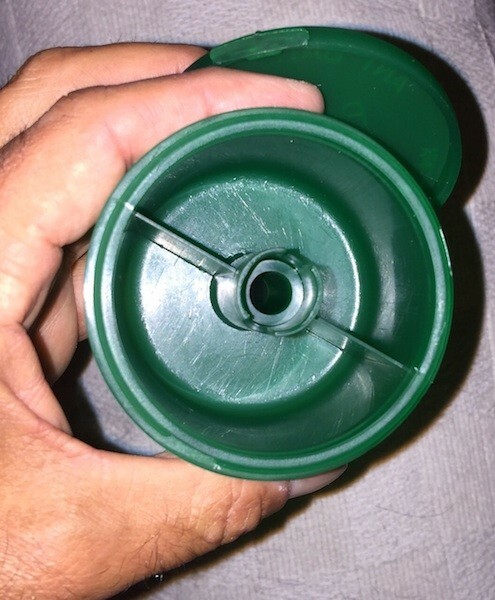 When using CAPSULE GUARDS, fill them with 1/2 ounce and make placements every 1-2 feet. ADVANTAGES OF USING GUARDS: When urine is placed on the ground without using guards, it might only last 2-3 weeks. When used with protective guards, applications will last 2-3 times as long. More importantly, placements will slowly dissipate instead of loosing it quickly which can happen during a heavy rain. Placements in guards can stand up to this weather pattern and "lock" the repellent scent into the treated area. I AM LOOKING FOR THE LIQUID AND GRANULE GUARD ON YOUR WEBSITE AND CAN'T SEEM TO FIND IT. I WANT TO GET SOME GRANULES FOR SQUIRREL REPELLENTS AND NEED TO THE CONTAINER BEFORE I PURCHASE THE GRANULES. The Guard above is used for both liquids and granules so in fact you're on the right page here. Use the "add to cart" button above for this item and you'll be getting the right device. The guards are sturdy and easy to use and fill. After one week, we haven't seen any gophers or squirrels digging or chomping on our garden. The green guards blend in well with the greenery of the yard. covered to keep out the rain and staked to the ground. Excellent buy.